What? Where? 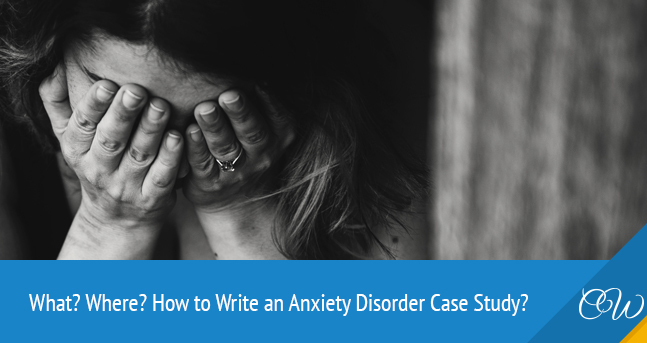 How to Write an Anxiety Disorder Case Study? Depending on the academic specialty, students compose different types of academic assignments on various topics. Thus, students of psychological and/or medical faculties write an anxiety disorder case study. This is an interesting piece of writing. It is targeted at revealing something new in the aspects, which have been already studied. This paper should extend or strengthen the previous studies. It brings a clearer explanation of the studied question. Anxiety disorder is a serious mental disease, which is likewise interesting. The disease is characterized by constant and unexpected attacks of fear, panic, and anxiety. There are multiple types of research targeted at identifying and clarifying the essentials of this mental deviation. Therefore, every student will have some food to chew on. Your first objective is to select a topic. Luckily, the choice is really rich and impressive. For instance, you may describe and analyze one of the anxiety disorder types, its causes, main symptoms or effective ways of treatment. The next step is to research your topic. Find all the related facts concerning anxiety disorder. This may be a social anxiety disorder. It’s characterized by overwhelming worry and nervousness in social situations. This type may be narrowed even more. Some people are afraid of being ridiculed. Describe this specific state. Seek targeted information and add something novel. The case has been studied for many a time. Therefore, you should gather general and well-known facts to begin with. Afterward, research the major question. This may be the most effective therapy for this particular type of the deviation. You should study all possible methods and identify the one, which produces the best results. You ought to find the approved evidence. Afterward, make an outline. Think which writing stages to undertake and how long every phase should last. Write a rough draft. It may be even messy. Your main goal is to see an approximate version of the accomplished paper. Implement the general information concerning your main question. Use some catchy and significant facts. A thesis statement. Clarify your main purpose in a single sentence (maximum two). Tell what you research and why. Make it strong and plain for understanding. Main plot. Develop the thesis statement. Discuss at least three sub-arguments. Use the dependable and effective examples (graphics, surveys, statistics, etc.). Summarize your project in three or four sentences. Mention your major argument once more. Reveal and interpret the outcomes of your study. In the end, proofread and edit the entire project. Check it several times to be sure that you haven’t made any mistakes. Once you verify every section of your writing, you’re welcome to submit.